On our website you find a lot of different tutorials about online casinos, casino bonuses and casino games. In this tutorial I am going to explain you how to sign up at an online casino. On the internet you find hundreds of different online casinos. They all have one thing in common. At all the casinos you need to register an account before you can start playing. At most of the available casinos registration is free of charge. There are a few casinos where you need to pay a small amount of money to join them. All the casinos on our website have free registration because we do not support casinos that ask money when our visitors join them. On this page you find a video tutorial and a step by step manual about the registration flow at online casinos. In this example I have selected 21 Casino because this casino is one our favorites and the casino offers you a few interesting bonuses. Other online casinos have similar sign up forms and most casinos ask the same personal data from you. In the underneath video you see how easy it is to sign up a free account at 21 Casino. When you follow these steps you are up and running at this online casino within a few minutes (seconds). Other online casinos have a bit similar sign up flows and most of them ask the same personal data when you join a casino. Underneath the video I am going to give you a step by step manual how to sign up at an online casino. And I will also tell you what is important during your registration. Before you sign up at an online casino it is important that you choose an online casino that you want to try. On our website in the menu, the tables and the sidbar you find different online casinos. All the casinos on our website are 100% reliable and safe and they all have free registration. You can chose a casino based on the game portfolio, the available bonuses or on it reputation. In the underneath screen you see a part of our website (21casino review). I marked the spots where you can choose a casino. When you click on these parts the casino will open in a new screen. On the image you see the bonus you get at 21 Casino and this image is clickable. 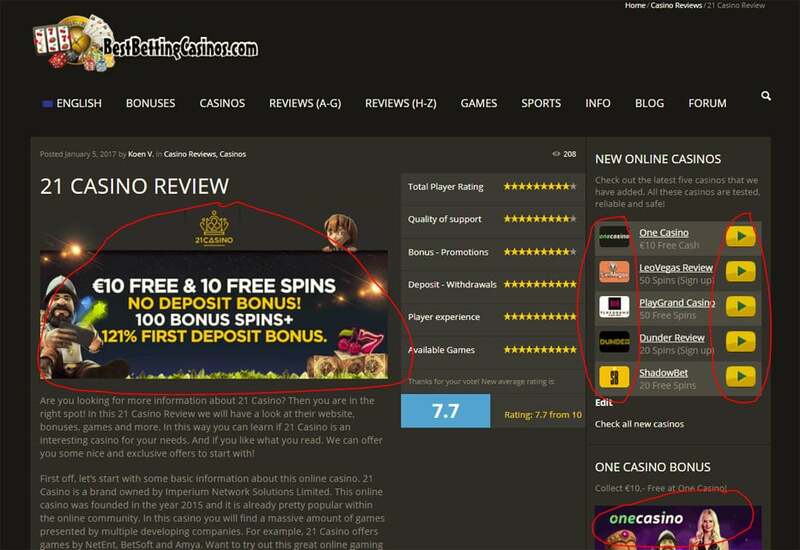 At the right side of the website you see “play buttons” and logos of different online casinos. When you click those buttons or logos we open the casino for you. And we activate the available bonus for you directly. As you can see you receive €10 free when you join 21 Casino for the first time. This is an extra bonus for our visitors. After you opened the casino there are 2 options. Most casinos have a so called “landing page”. On this landing page you find the available bonuses, the Terms and conditions and the sign up steps. 21 Casino offers a landing page (see underneath) and the lander has a “join now” button. When you want to continue signing up at the casino you need to click the join now button. You now see the first step of your registration. At online casinos you always need to fill in your personal data before you can start playing casino games. It is very important that you use the correct data because this is important for legal playing. When you use fake data and you manage to win money, it is impossible to withdraw those winnings. Your sign up data needs to match with the data used on payments and withdrawals. In the first step you need to make a new username and password. This is personal and you can think of your own username and a private password. When a username is already in use or incorrect you receive a notification from the casino directly. Think of a safe password and never communicate your password with other people. When you share your password other people can play with your money at the casino. Click the “Next Step” button and activate step 2 of the registration form. Before you can go to the next step you need to confirm that you are 18 years or older and that you accept the terms and conditions. It is very important that you do not play at online casinos when you are younger than 18 years. Registration code – this field is not always available or required. Sometimes you need a registration code in order to collect a bonus. And you always need to confirm that you are 18 years or older. After you filled in all your correct data you can sign up your account and verify the account in your email. You always receive an email from the casino to verify your account. Click on the link in this email and your account is verified. After you verified your new account you can login with your username/ email and your password. now it is time to collect the available bonuses. In the underneath table you see the Top 10 casino bonuses on our website. After you registered your account at one of these casinos you can collect the bonuses. At 21 Casino this means you receive €10 free play money in your account. You can use this money to try a few games and see if you like the casino. The 121% deposit bonus is a bonus that you receive when you make a first real money deposit. Deposit an amount of money and 21 Casino gives you 121% extra play money for free. In the underneath table you see many different types of bonuses and casinos. Check out what you like and when you are ready you can click the “play button” to open the casino. We activate the available bonuses for you while you sign up at an online casino. I recommend you to try Casilando and One Casino. As you can see it is very easy to sign up at an online casino. casinos try to make things as easy as possible but still there ae a few important things you have to look at when you decide to join an online casino. Keep an eye on the following things when you join a casino. Is the casino safe and reliable? Why should you sign up at an online casino? If you like gambling or betting on sports, and you normally go to land-based casinos or bookmaker offices, it is interesting to look at online casinos. Online casinos offer exactly the same games and experiences as an offline casino. Why should you drive to a land-based casino or a bookmaker office when you can play casino games and bet on sports from the palm of your hand. Most online casinos are available for desktop, tablet and mobile devices so there is no need to drive a long way. Just sign up a free account at an online casino and start playing while sitting in the comfort of your own house. There is no sign up fee, no fuel costs or parking cost when you start playing at an online casino. On top of that online casinos offer bonuses. Most land-based casinos don’t offer bonuses when you visit them. Online casinos offer all kinds of bonuses to convince you to join them. On our website you find the best no deposit bonuses, free spins offers, €5 free bonuses and 200% welcome bonus offers. In the underneath table you find a selection of online casinos that offer you €10 free play money when you join them.